For the past two years Galway has gone wild…for wildlife! 2017 marked the second annual celebration of Galway’s wildlife as part of Ireland’s National Biodiversity Week, and thanks to our project being chosen as one of the two National Flagship events by the Irish Environmental Network (IEN), the funding we received meant this year was bigger and better than before. The two day event was organised by the VWT in partnership with BirdWatch Ireland and NEAR Health1 with funding from the IEN, Bat Conservation Ireland and NEAR Health, and we brought together the best of Galway’s people and nature. In 2016, we launched ‘Go Wild’! The purpose behind this festival of wildlife is best captured by a quote from Sir David Attenborough “No one will protect what they don’t care about; and no one will care about what they have never experienced”. Our goal was simple: to celebrate the unique natural heritage of Galway City whilst harnessing the interest and enthusiasm that exists for our local wildlife. 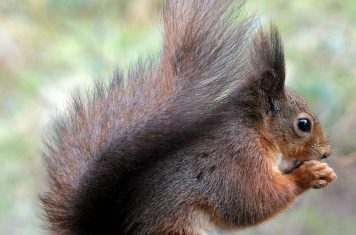 With red squirrels, pine martens, Irish stoats and lesser horseshoe bats within the city boundaries, we have an important natural heritage to protect. We hoped people would recognise the value of their local environment with the help of experts from BirdWatch Ireland, NEAR Health, Irish Wildlife Trust, Galway Bat Group, Irish Whale & Dolphin Group, Swift Conservation Ireland, National University of Ireland, Galway and freshwater ecologists Heather Lally and Martin Gammell from Galway-Mayo Institute of Technology. There is a connection between biodiversity and all aspects of our lives and we are innately aware that there are significant benefits from increasing how much time we spend interacting with the natural world. Yet there is often a disconnect, particularly in urban areas, between people and nature. The Central Statistics Office reports that over a quarter of adults have volunteered in Ireland. Studies show, however, that the Irish environmental sub-sector is quite small both within the Irish voluntary sector as a whole and compared to environmental NGOs in Europe. Government funding in Ireland is €3.1m compared to €12.27m to €21.1m in Northern Ireland and €240m to €368m in the UK (depending on the system of assessment). Ireland lacks important features of other countries, such as lottery and philanthropic funding2. With big goals to foster the environmental volunteers and spokespeople of the future whilst reconnecting people with nature, there was no time to waste. The team set to organising a weekend of free wildlife events making nature accessible to people of all ages and interest levels with talks, field trips, workshops and wildlife documentary screenings! Our two-day event began at 4:30am on Saturday 20th May with a dawn chorus led by John Lusby, Raptor Conservation Officer with BirdWatch Ireland. We began at Silver Strand, a beautiful sandy beach overlooking Galway bay on the western edge of the city and walked through nearby woodlands, between intertidal meadows and along the beach to overhanging cliffs where we marvelled at aerial displays from sand martins flying to their tunnels. The group recorded 35 different bird species and I brought a bat detector to catch some dawn flying pipistrelles, checked Longworth traps for a sleepy bank vole and looked for signs of stoats on trail cameras. After two and a half hours we were still wildlife watching! The group took part in a NEAR Health questionnaire about how they felt by spending this time out in nature (showing impressive enthusiasm at 4.30am!) and also completed the first part of our wildlife spotting competition. It was a fantastic start to Go Wild 2017! Back at ‘Go Wild HQ’ in the National University of Ireland, the hall was filled with stands, displays, information to take away, specimens, samples and experts from each organisation were on hand to talk about all things wild – what a great buzz of excitement there was in the air! 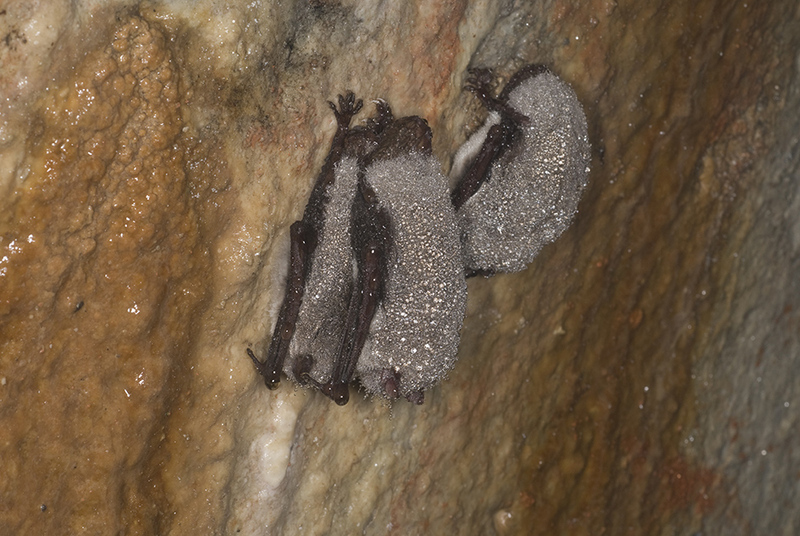 Members of the public could choose from a full schedule of walks and talks ranging from NEAR Health where participants learned about their role in their local environment and its role in their health and wellbeing to Birds of Galway city; Irish whales and dolphins; The secret world of mammals; Otters of Galway; Water plants and insects, and Kate McAney fascinated the audience with ‘Galway’s bats – making headlines since the 1800s’. For the second year running, Go Wild was blessed with a gloriously sunny day and we led field trips in the University campus and the city – checking the Longworth traps we had set at 3am that morning! It was worth the early start and an excited audience watched as we demonstrated how to handle and identify bank voles which had been live captured, whilst looking for birds nesting and flying along the rivers and canals of Galway city – taking the total number of birds identified to 45! It was a perfect opportunity to discuss the habitat needs of animals in the wild and value of a healthy ecosystem, including in urban environments. Back at HQ Tom Cuffe ran a children’s workshop with facts about wild creatures, and taught them to create their own animals using origami. Gesche Kindermann and Caitriona Carlin led a workshop on restoring health and wellbeing through contact with nature, on behalf of NEAR Health, NUI Galway. The aim of the workshop was to envisage a nearby healthy future space for people and wildlife and then work out how to create it – their senses aided by their location among willow trees alongside the river Corrib. Afterwards Tom Gorman, Heather Lally and John Lusby led a field trip along the banks of the River Corrib to examine otter spraint, identify birds by their call and through sightings and identify aquatic invertebrates and the nature of their various life stages from kick samples taken in the river. Sitting in the glorious sunshine, surrounded by people brought together by Go Wild and now enthralled in the natural world I wanted to pinch myself – this is what it was all about. Disconnecting from screens and reconnecting with nature. Yet there was so much more to come…and at sunset Galway Bat Group led a bat walk from Galway Cathedral along the River Corrib where people learned about the ecology of Irish bats and heard the echolocation calls of Daubenton’s and Leisler’s bats and Soprano pipistrelles. 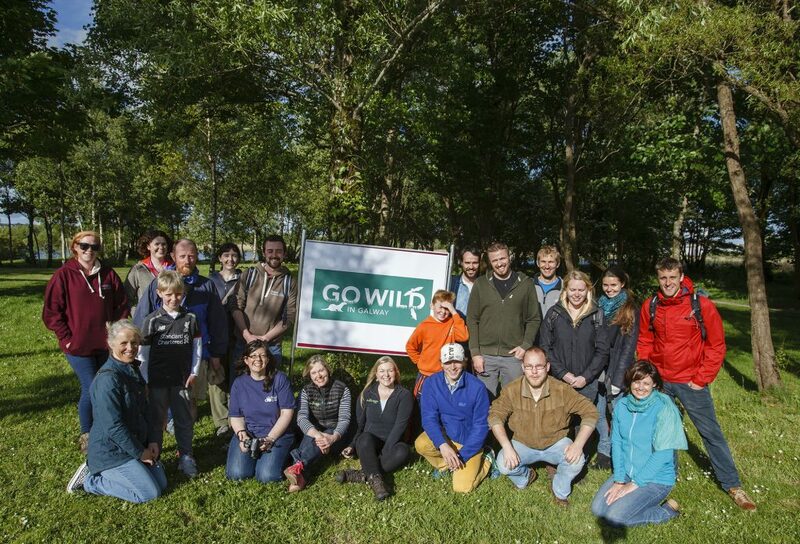 We finished our walk at the caddisfly trap to bring Day 1 of Go Wild in Galway to a close. Day 2 took place at renowned Galway theatre: An Taibhdhearc where Go Wild brought two wildlife documentaries from Crossing the Line Films, an award-winning Irish production company, to the big screen. With butterflies in my stomach I took to the stage and welcomed everyone to what was to be a very special evening. The first documentary was Wild Cities – Galway, presented by John Lusby and part of a national series revealing Galway’s wildest and most secretive residents. Highlights included stunning slow motion footage of lesser horseshoe bats in a castle on the edge of the city and charismatic otters in Galway’s canals. After refreshments, the second screening of the night began. Éire Fhiáin – An Cósta Thiar is natural history filmmaking at its best and takes the viewer on a journey along the 1,600km of rock and ocean that make up Ireland’s Atlantic edge. Enigmatic wildlife is set against stunning land and seascapes in a two hour documentary presented by Eoin Warner in the Irish language. In one scene the audience laughed along at two playful pine martens on the big screen, delighting in the creatures. It was a moment I won’t forget. Afterwards we held a panel discussion with both presenters onstage to share their experiences of the filming and we talked about the effect Ireland’s wild places have had on our lives and our health and wellbeing. The audience were keen to discuss wildlife conservation, the natural world from an Irish context and how we could use these documentaries to reach a larger audience, including decision makers. We hope that by helping people to experience nature on their doorstep they will feel moved to care about and protect it. With the quickening pace of life and technology, the need to look to our natural world for escape and solace is more important than ever. Go Wild has since continued into Heritage Week and Science Week where we ran Go Wild Nature Camps for children with funding from The Heritage Council, Galway County Council, Galway- Mayo Institute of Technology and European Green Leaf. We set ourselves a big task to develop the environmental guardians of the future, but after Going Wild in Galway…it feels very possible. 2Funding Environmental Non-Governmental Organisations In Ireland; Irish Environmental Network, 2015.